I love Stuttgart… it’s been another fantastic week at the Porsche Tennis Grand Prix where Angelique Kerber successfully defended her title, beating Laura Siegemund in the final. 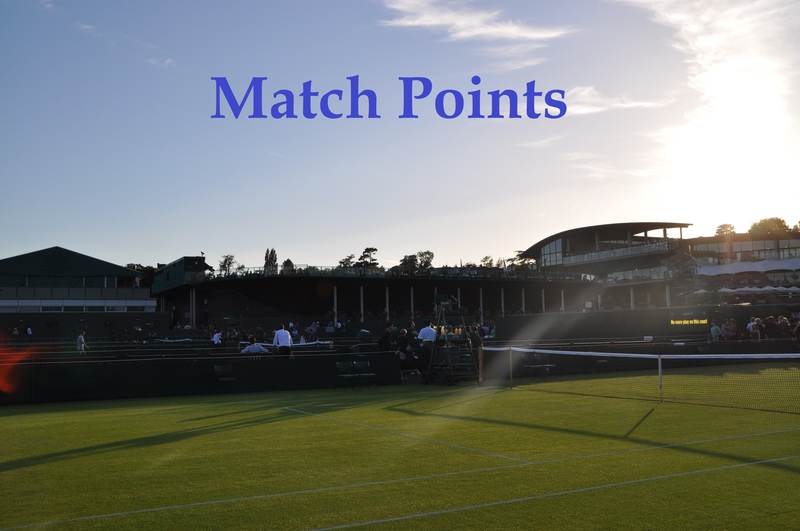 This is always one of my favourite tournaments of the year and read on for my match points to round up the week’s action including the best matches, tweets, pics, shots, articles and plenty more. I’m undecided whether i’ll be blogging next week for Prague and Rabat with two packed weeks in Madrid and Rome to follow. Angelique Kerber recovered from a *0-3 deficit to win 12 of the last 13 games and end the dream run of Laura Siegemund with a 6-4 6-0 victory in the final. Siegemund began right where she left off from against Radwanska, playing aggressively and mixing in drop shots, slices and spins. Siegemund is so comfortable at the net but Kerber began to get a read on all the drop shots and is one of the best, if not the best, at picking her targets with the passing shots. Kerber really settled into her groove as Siegemund finally ran out of steam in the second set… but what a week for Laura :-). Caroline Garcia and Kristina Mladenovic won their second consecutive title and extended their winning streak to eight matches, defeating Martina Hingis and Sania Mirza in the doubles final, 2-6 6-1 10-6. Garcia & Mladenovic get their groundstrokes locked in in the 2nd set & power past Hingis & Mirza, 26 61 10-6 for the Stuttgart title. It’s always enjoyable when two players with completely different game styles come together… this was a lot of fun. Not a classic, but some really great moments in the first of the semi-finals. Kvitova showed some encouraging signs, but Kerber showed tremendous focus to win the last four games of the match. It took a while to get going but once it did, it was a very entertaining contest. Kerber and Beck combined for 28 winners in the third set, much more engaging than the scoreline would suggest. A high quality first round contest that is not necessarily going to make the headlines but is well worth watching back. Petkovic laughing at the end of on-court interview: "One question – why do you have such an unflattering picture of me on the giant screen?" Crazy stats on both levels from this first round match… Kvitova keeping it clean but Chirico failed to hit a winner. Along the same line, rare to see Halep hit so few winners, but what a match from Siegemund in the second round. The winner-unforced errors ration from the third set of Kerber-Beck was pretty amazing. And Kerber kept it up in her quarter-final match against Suárez Navarro, producing an even better winner-unforced error differential. Laura Siegemund’s reaction was akin to when she defeated Jelena Jankovic at the Australian Open but X100! A couple of clutch match point saves from Kvitova in her second round match against Monica Niculescu. And in one of the points of the tournament, this showcases all you need to know about Niculescu. There was one rally in the Kerber-Kvitova match that was amazing. The one linked below is another good one, which came immediately after the one referenced as Kvitova broke back to 2-2 in the third set.
.@Petra_Kvitova gets the break back! Kerber though produced a remarkable get in the next game to break straight back and didn’t drop a game from there, marching into the final. Siegemund was on it with the drop shots in her semi-final against Radwanska, producing this gem on set point. Kerber and Beck shared a moment after their second round match on Wednesday night. Julia Goerges is one of the most respectful players on tour at the net. And add Petra to that list too! This was a nice touch from Angie in the final. "A lot of pressure", Vinci on returning to Rome soon. "But I always play so bad in Rome, for sure I'll play bad" and breaks into laughter. Radwanska in good spirits after a much better start to the 2016 clay season. Her driving style? "Fast! But careful!" followed by laughter. QUESTION: Given your degree in psychology, when [you] served for the match what did you think? SIEGEMUND: I try not to think. Lots of great pieces this week so bear with… a big thanks to René Denfeld of The Tennis Island for some superb coverage all week in Stuttgart. Here’s a couple of my favourites from the week. Enjoyed this piece on the WTA website about Irina Falconi, who won her first WTA title in Bogota last week. Delighted to hear that Rebecca Marino is in a much better place after retiring from tennis a few years ago. And a big thanks to Mitch for contributing two guest posts for Moo’s Tennis Blog from his time at the Australian Open this year. 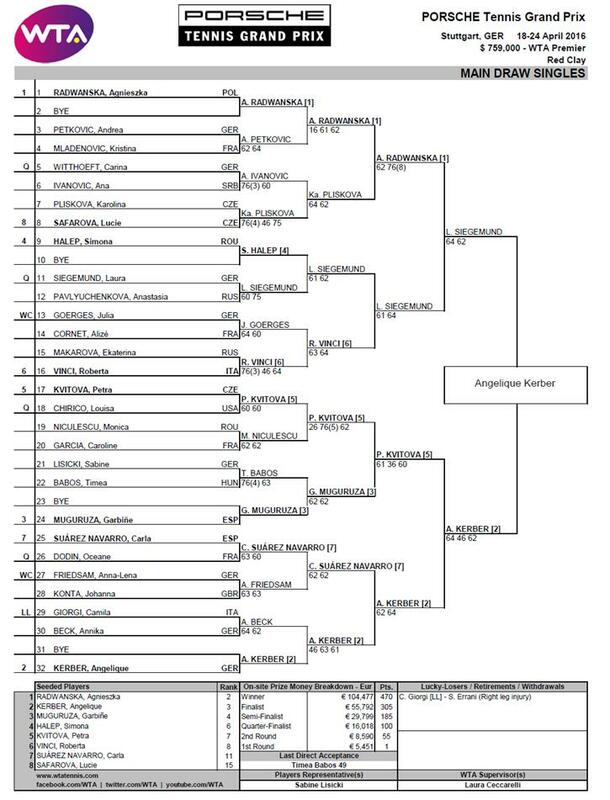 Tennis Draw Challenge: Congrats to this week’s winner who were Vitt97 (Stuttgart) and panmich (Istanbul). More details on how to join the league can be found HERE. Racket Rally: Bosiddon continues to lead the Moo’s Tennis Blog league and, at the time of writing, is the top scorer of the week with 47 shares in Fernando Verdasco who made the final in Bucharest. I’m losing interest a little bit and i’ve now realised Kasatkina isn’t playing in Prague! To join RR or update your team, click HERE. Follow Moo’s Tennis Blog on Twitter (@Moo_Tennis) HERE and Facebook HERE. April 24, 2016 in Match Points, Stuttgart, WTA. Mladenovic and Garcia winning second title in a row on clay. Didn’t look like it’d be the case in the first set though. Mladenovic seems to start slow quite a lot in their finals. But they got it together and could prove a force to be reckoned with over the rest of the season. Yeah, they seem to have a good chemistry too. I’m very happy to see Caroline smiling again after the ordeal she’d been subjected to by what passes for the media (including social media) recently. Didnt seem to hold Pliskova back. The first 6 points of her match against Voegl were winners! Really impressive stuff.